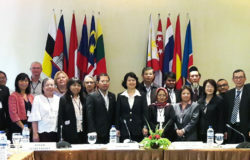 Twelve officials and staff of the Philippines Department of Agriculture (DA), one local government official and two representatives from the private sector gained new perspectives and insights on how the Indonesian government, particularly its farmers, tackle the challenges of climate variability through an Overseas Study Mission on Climate Change Adaptation and Mitigation they undertook there on 28 March-1 April 2016. Organized by the Southeast Asian Regional Center for Graduate Study and Research in Agriculture (SEARCA) in collaboration with the International Center for Tropical Agriculture (CIAT) Regional Office for Asia based in Hanoi, Vietnam, this third and last leg of the Study Mission aimed to provide the participants first-hand knowledge and information on how institutions in Indonesia integrate climate change considerations and initiatives particularly in the agriculture sector. 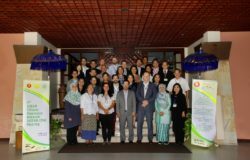 The visit was also facilitated by ASEAN Climate Resilience Network (ASEAN-CRN) by introducing the network’s partners in Indonesia. The study mission is part of the component on Capacity Building of the DA Project on Strengthening Implementation of Adaptation and Mitigation Initiatives in Agriculture (AMIA) being implemented by SEARCA in partnership with the UPLB Foundation, Inc. 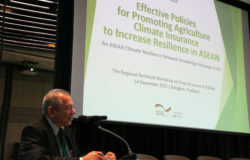 In Jakarta, the group met with Dr. Hasil Sembring, Director General of Directorat General of Food Crops, Dr. Chandra Indrawanto, Deputy Director for Research Cooperation and Public Relation, IARRD and Ms. Syamsidar Thamrin, Deputy Director for Weather and Climate of the Ministry of National Development Planning (BAPPENAS). Dr. Sembring presented the Indonesian government’s Rice Development Program for 2015-2019 which outlines the different strategies of the government to increase rice production for food security as well as to improve the the livelihood of farmers who are most vulnerable to climate change. Some of these strategies include the development of 1000 seed self-sufficient villages, improvement of irrigation facilities, procurement of 100,000 units of agricultural machineries, development of 2 million hectares of marginal lands and scaling up of best management practices in rice production. 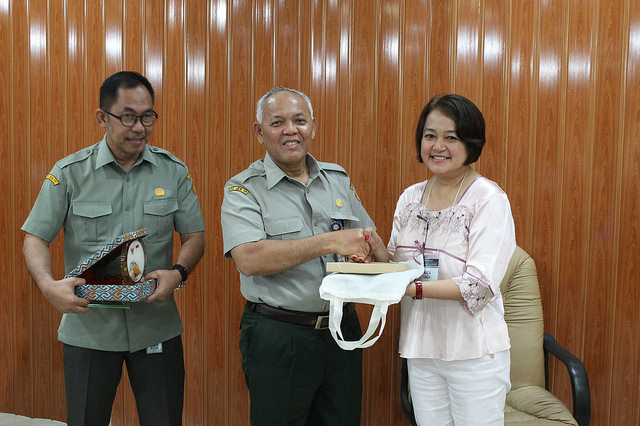 In Bogor, the Study Mission Team was warmly welcomed by Dr. Ed Hussein, Director, ICALRRD. ICALRRD is tasked with the development and evaluation of research programs on the efficient utilization of agricultural land resources, research on remote sensing, agricultural land resources inventory, among others. The group was given an overview of the Integrated Cropping Calendar Information System developed by IAHRI as a decision-support system tool that provides information on seasonal climate forecast cropping pattern, potential planting areas, flood or drought prone areas, pest infestation, fertilizer rate recommendations and appropriate varieties based on climate forecast. The agency also generated Land Suitability Maps for Selected Agricultural Commodities such as oil palm, cacao, orange and sugarcane in nine provinces and two regencies in Indonesia that serve as input to land use planning and crop suitability evaluation. The group also visited the Indonesian Center for Agricultural Technology Assessment and Development (ICATAD) which houses the demonstration farm for the government-initiated “Sustainable Food-Reserved Garden (SFRG)”. The SFRG espouses the concept of home-yard garden in a village or district mainly to strengthen food security at household levels and as an effort to reduce global warming by using household waste as planting media and utilizing the garden as a source of family food. 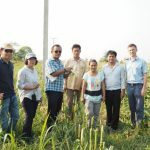 One of the major highlights of the Study Mission was the opportunity to interact with the rice farmers in Subang and Indramayu, West Java, the area where the first Climate Field Schools (CFS) were piloted. The rice farmers are members of the Indramayu Rainfall Observers Club who took part in the Science Field Shops (SFSs), an “on-field” agro-meteorological learning project between farmers, farmer-scientists, and farmer-extension workers/facilitators. Organized by anthropologists from the Center for Anthropological Studies of the Faculty of Social and Political Sciences, University of Indonesia in collaboration with the Agromet Vision-Netherlands, the SFSs is considered to be a new extension approach whereby the farmers are the active learners, carrying out their daily observations of rainfall and agro-ecosystems, documenting their findings, analyzing and discussing these findings through regular monthly meetings. Through the SFSs, the farmers said that they gained a deeper understanding of the impacts of climate change. 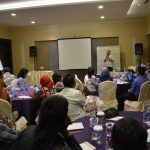 The regular monthly meeting of the Indramayu ROC has become a venue for knowledge sharing among farmer-observers as they learn from each other’s experiences on alternative cropping and land use strategies that would help them avoid harvest failures or yield reductions.